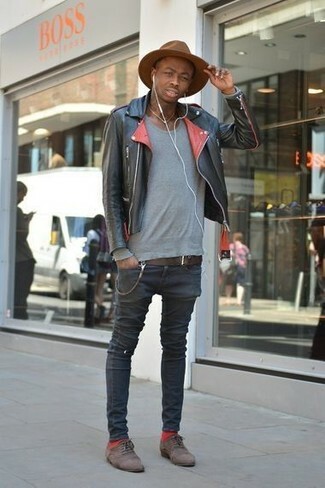 If you're all about practicality dressing when it comes to your personal style, you'll love this stylish combo of a black leather biker jacket and an Asos brand wide brim fedora hat in brown felt with geo tribal print band. Bump up the cool of your getup by finishing off with dark brown suede oxford shoes. 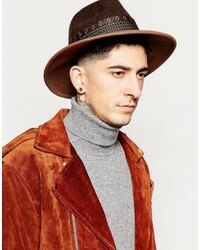 We all outfit for comfort when it comes to dressing up, and this combination of a dark brown leather barn jacket and an Asos brand wide brim fedora hat in brown felt with geo tribal print band from Asos is a good illustration of that. You could perhaps get a little creative when it comes to footwear and elevate your look with tobacco leather casual boots. 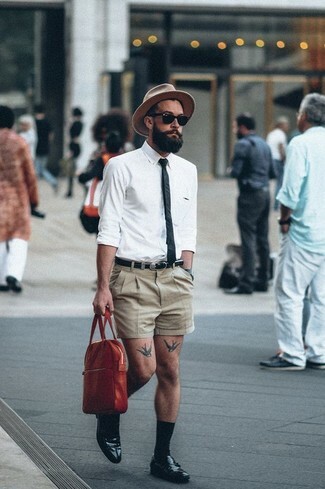 We all want comfort when it comes to dressing up, and this combination of a white long sleeve shirt and an Asos brand wide brim fedora hat in brown felt with geo tribal print band from Asos is a practical example of that. Channel your inner Ryan Gosling and rock a pair of black leather loafers to class up your look. 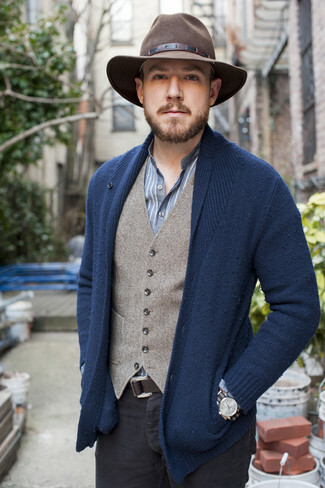 If you're all about relaxed dressing when it comes to your personal style, you'll love this stylish combo of a navy shawl cardigan and an Asos brand wide brim fedora hat in brown felt with geo tribal print band from Asos. 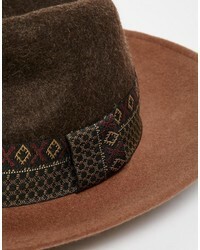 If you prefer relaxed dressing when it comes to your personal style, you'll love this easy combo of a brown gingham blazer and an Asos brand wide brim fedora hat in brown felt with geo tribal print band. Smarten up your getup with dark brown leather monks. If you prefer practicality dressing when it comes to fashion, you'll love this stylish pairing of a white v-neck t-shirt and an Asos brand wide brim fedora hat in brown felt with geo tribal print band. Up the ante of your look with grey high top sneakers. 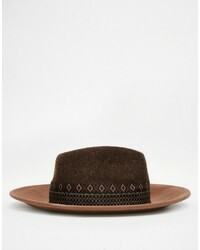 Try teaming a black cotton blazer with an Asos brand wide brim fedora hat in brown felt with geo tribal print band, if you want to dress for comfort without looking like a hobo. 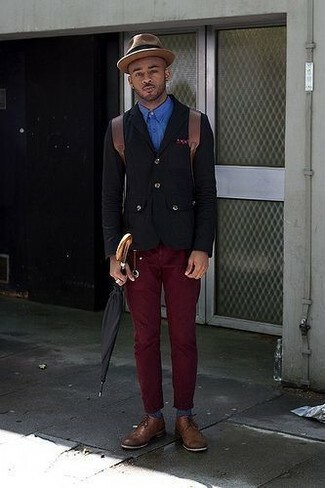 Rocking a pair of brown leather derby shoes is an easy way to add some flair to your getup. 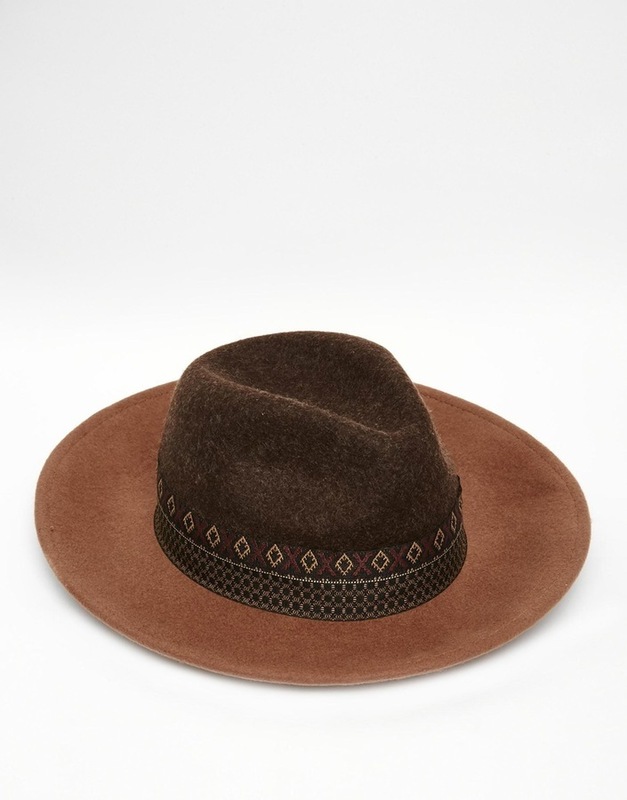 Go for a burgundy corduroy barn jacket and an Asos brand wide brim fedora hat in brown felt with geo tribal print band from Asos for a weekend-friendly look. 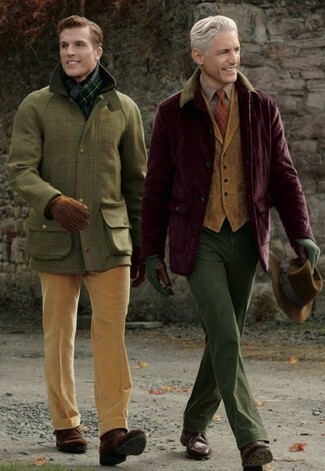 Channel your inner Ryan Gosling and make dark brown leather derby shoes your footwear choice to class up your look. 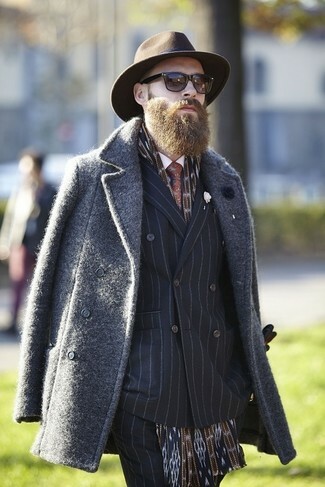 If you're a fan of functionality dressing when it comes to fashion, you'll love this on-trend pairing of a charcoal overcoat and an Asos brand wide brim fedora hat in brown felt with geo tribal print band.